Manoir Belle Epoque is a beautiful Maison de Maitre originally built in the 1830s by a wealthy wine and brandy producer, as a symbol of his affluence during this opulent era. It is now lovingly restored and decorated by its owners, talented interior designers who have turned it into a large, modern home with plenty of original character, perfect for families and groups of friends. The position is semi-rural but on the edge of a lively village surrounded by sunflowers and vineyards, with a grocery shop, bakers, butchers, bar, pizza restaurant, post office and pharmacy – all just a 5-minute walk away. There is even a park with children's' slides and swings, all within pram pushing distance! Just a 5-minute drive away is the Canal du Midi at Ventenac, with its good choice of restaurants and within easy reach are Lezignan-Corbieres and the Cathedral City of Narbonne and its high quality sandy beaches beyond. Carcassonne is just over half an hour away. In keeping with the Belle Epoque and this villa's origins, this lovely home is designed for fun and good times for all, with a hint of elegant grandeur from times passed. A grand curved staircase and balustrade onto the front balcony and terrace compliment the indoor marble staircase and grand dining room. A games room and ‘honesty wine cellar' stocked with Languedoc wines, and a large garden full of fruit trees, hammocks, shady terraces and a big pool, keep everyone happy. There is even a fenced in shallow brook with small fish through the back garden, where you can try your luck with a line and hook or bucket. 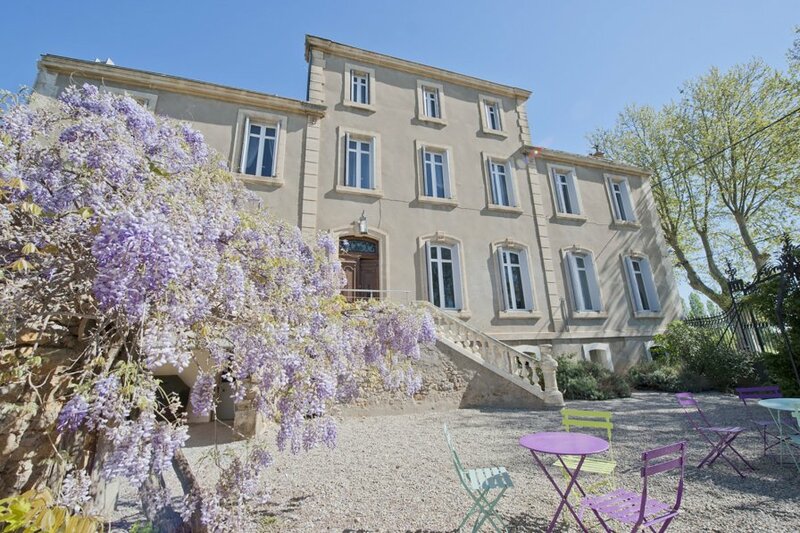 Manoir Belle Epoque will delight the senses and provide an idyllic location for a holiday or special reunion in the Languedoc. Good news! For a little extra, this property is available as a Vill'otelYey! Wait… what is that? Manoir Belle Epoque sits in a picturesque village nestled amongst the charming vineyards and sunflowers of the department of Aude in the heart of Languedoc. Here you will find boulangeries, butchers, a small grocery shop, a bar, pizzeria restaurant, post office, pharmacy, doctor's surgery, a park with children play area and even a vegetable market every Friday and Sunday mornings. Larger supermarkets are located in Lezignan Corbieres (4km). In Ventenac there is a Wine Cave, perfect for getting to know the fabulous wines of the region. The imposing Corbieres mountains where one can visit the fascinating Cathar castles, can be reached in just 10 minutes. Furthermore, the Mediterranean coast is a half hour journey, offering easy access to the beautiful beaches in Gruissan and Narbonne. When the beaches are too crowded, why not head to Homps and take a dip into the lake? It is a family-friendly option well serviced with a cafe, life guard and plenty of free parking.